When bees are in the headlines, I hear about it from my friends and people I know. Last week, a lot of people got really excited about this headline: Cheerios is giving away free wildflower seeds to raise awareness about the declining bee population. Their famous bee mascot even took a hiatus from the brand's cereal boxes. While I appreciate any large corporation using their platform to raise awareness about honeybee decline, their efforts were at best tone deaf and at worst dangerous for the ecosystem. Many of the flowers included in the mix are not that great for bees, and some of the varieties are actually noxious invasives that are banned in certain states. For example, the California poppy is listed as an “invasive exotic pest plant” in southeastern states. Not to mention the nasty chemicals used to grow the ingredients in the cereal products Cheerios sells - but that's a whole other story. The truth is, planting flowers really is the best way to help the bees. Just like our food, it's important to read the labels and do your research when you're choosing seeds and plants to put in your garden. It doesn't need to be a "Save the Bees" flower mix. Bees love sunflowers, bolted (flowered) herbs like basil and chives, borage (an edible flower), the list goes on and on. Just make sure your seeds are non-GMO and not treated with any pesticides or chemicals. Fourth-grade bee supporters on Earth Day in 2015 at the Arts Garden in Indianapolis. If you really want to get your hands on a bee-friendly seed mix, here are a few options: run to a local garden center (my personal favorite is The Garden Center at 71 & Michigan Rd. in Indianapolis) and pick up a package of non-GMO, organic flower seeds. It'll be the best $1.50 you ever spent. Find a native seed mix for your region on the Xerces website. Or, if you're in the Indianapolis area, Bee Public will be handing out organic, non-GMO "Autumn Beauty" sunflower seed mixes at Earth Day Indiana Festival on April 22. Calling all citizen scientists! Join us this week as we team up with Keep Indianapolis Beautiful and SustainIndy to engage in the important work of not only counting pollinators—birds, bees, butterflies and other beneficial insects—but educating Hoosiers on the need to plant native to help people and nature thrive! Yesterday, Mayor Joe Hogsett signed a Monarch Pledge and urged all Indy residents to do their part to protect pollinator health. Bee Public will host a FREE bee talk on Tuesday, July 19 followed by a pollinator count along the Monon Trail in Broad Ripple. Check KIB's website and follow #KIBees to learn about upcoming Pollinator Count events, where you can pick up a counting kit (or save a tree and download one), engaging talks, and more about this city-wide goal to increase wild pollinators. This program will serve as a measuring tool to encourage a healthy and thriving Indianapolis and increase biodiversity in our neighborhoods and communities! On June 6, 2016 the Indianapolis City Council passed a resolution recognizing the importance of pollinators and urging the city of Indianapolis to refrain from the use of neonicotinoid pesticides. Thanks to all who made this a successful night and a crucial first step in making Indy a bee-friendly city! On April 22, 2016, Indianapolis Mayor Joe Hogsett kicked off Earth Day with a bang. Or rather, a buzz. Our Save the Bees Indiana project - a collaboration between the Arts Council, Earth Charter Indiana, and Bee Public - has an art exhibit on display now at the Artsgarden downtown. 4th and 5th graders from all over Indiana created 3-D bee sculptures from recycled materials to raise awareness about bees and pollinators. We gathered at this space on Earth Day morning, along with students and teachers from Sidener Academy, Center for Inquiry (they walked there!) and Butler Lab School (they rode IndyGo!). The Mayor spoke and proclaimed it Indianapolis: A Bee Friendly City Day, recognizing that we depend on pollinators for a third of our food supply and that Indianapolis can do more to help their declining populations. This is the first step to creating a bee-friendly city! At the end of the event, students presented bee sculptures to the mayor and we all did the waggle dance! “How do you feel today?” I always start my classroom visits with this question. Typically I’m met with a resounding chorus of “HAPPY!” or the occasional “I have to pee!” but lots of squeals and laughter none the less. My presentation to the entire elementary school at the Indiana School for the Deaf a few weeks ago went a little differently. I asked the room of about 100 kids and teachers to tell me how they felt, and they all began signing at once. My American Sign Language Interpreter turned to me and said, “I’m seeing a lot of happy’s.” Then, just as I always do, I asked the group to tell me once again how they felt, but this time by dancing. And we all danced together. Why do I do this? Because bees dance to communicate, of course. And it’s just plain fun. My ASL interpreter stood by my side and signed as I spoke to the students. She also flapped her wings, rubbed her belly, and conveyed every emotion I mentioned during my hour-long talk about the importance of bees. One little boy in the front row shot his hand up and signed a question to me, his hands frantically forming a crown on top of his head. 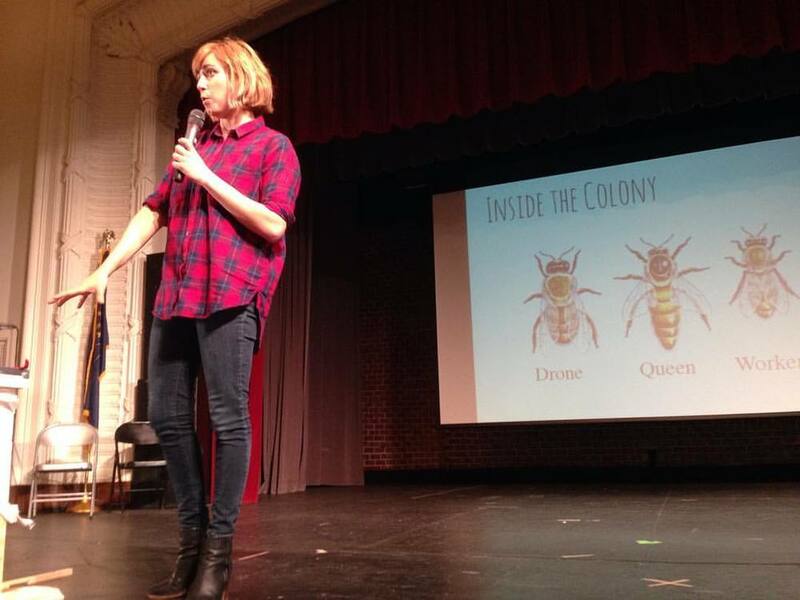 He asked, “If there’s a queen bee, does that mean there’s a king bee?” Great question. I had to break the news to him that not only is there no king bee, but the male bees inside the hive, drones, get a lot of flack for not doing chores around the hive. And they don’t even have stingers. The School for the Deaf, with students ranging from toddlers to high schoolers, is just one of at least six schools getting a hive this spring as part of our Save the Bees Indiana initiative (thanks to a Sustain Indy grant.) The School for the Deaf’s hive will sit in their raised bed vegetable garden and pollinator garden in the middle of their campus, next to the high schoolers’ dorms - in fact, the high schoolers will be in charge of looking out for the bees on a daily basis. These schools will have a front row seat to the incredible service that bees do for us, pollination, and can incorporate lessons from the hive into any subject’s curriculum - science, math, nutrition, even literature. I always get asked this question: “How many times have you been stung?” I’d say no more than 8 or 9 times - pretty great odds is you consider how many hundreds of thousands of bees I’ve been around over the last few years. I’m here to tell you that getting stung is really no big deal and can easily be avoided by wearing the proper gear. The sting itself doesn’t really hurt, it’s the reaction that follows that is the most annoying (unless you’re allergic, in which case you need to get an Epi-Pen and carry it with you.) But most of us have a fear of getting stung, it’s human instinct. No stings here - a sunny mid-summer day means most of the bees are out of the hive foraging for nectar and they’re happy as can be. They say you don’t really become a beekeeper until you get stung. It’s bound to happen, whether or not you’re working with bees on a regular basis - bees and other bugs that can sting are everywhere! In fact, there’s a good chance that bug that stung you wasn’t even a bee. Often our bad experiences with black-and-yellow-striped-flying-stinging things are with wasps, yellow jackets, or hornets. There are a few key differences between bees and these other species. Wasps, yellow jackets, hornets, and the like, while still important pollinators, can, and often will, sting more than once. Honeybees, on the other hand, are gentle in nature and only sting when they feel threatened. And when a honeybee stings, she dies. A honeybee’s stinger is barbed and usually stays behind when she stings, removing some vital organs in the process. So what should you do if you get stung by a honeybee? The most important thing is to remove the stinger immediately. The bee’s stinger will continue to pump bee venom into your skin so the sooner you get it out the better. There are two methods that work for this: one is to pinch and pull it out with your finger or tweezers. Many beekeepers say this poses the risk of squeezing more venom out of the stinger and into your skin. The second method is to use a flat object, like a credit card or hive tool, to scrape across the skin until the stinger pops out. Either method works just fine- it’s most important to get the stinger out ASAP. I waited a little too long to get this stinger out. After-sting treatments such as ice and baking soda work pretty well to reduce swelling and neutralize the acidity of the bee venom. If you your sting starts to swell or doesn’t get better in a few days, see a doctor. If you have trouble breathing or show other signs of an allergic reaction, get to the emergency room right away and make sure that you carry an Epi-Pen in the future. What a treat! The warm weather means we get to open up the hive and say hello.